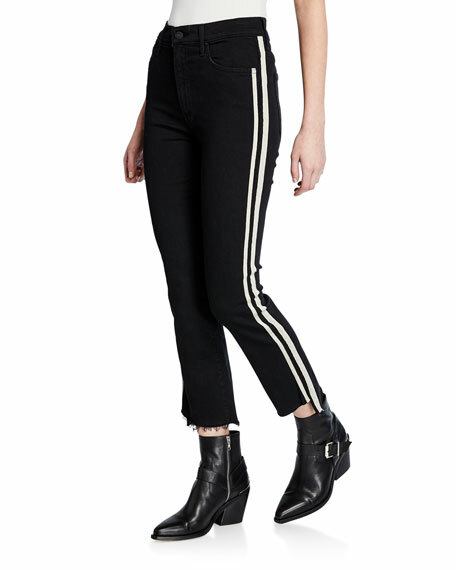 7 For All Mankind jeans in stretch denim. Approx. 10" rise; 26.5" inseam; 19" leg opening. Four patch pockets. Slim fit through flared legs. Cropped above ankles. Button/zip fly; belt loops. Cotton/polyester/spandex. Machine wash. Made in Mexico. 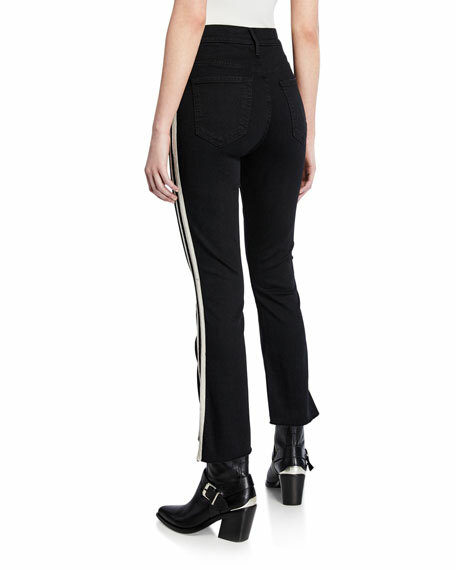 Helmut Lang "Femme Hi" jeans in tailored stretch denim. High-rise; belt loops. Five-pocket style. Slim fit through boot-cut legs. Full length. Button/zip fly. Cotton/spandex. Made in Italy. Hudson "Barbara" jeans with fading and distressed details. Approx. 30" inseam. High waist. Five-pocket style. Fitted through straight legs. Full length. Cuffed hem. Button/zip fly; belt loops. Cotton/polyester/spandex. Machine wash. Made in Mexico. Hudson "Jessi" boyfriend jeans with heavy destruction down front. Approx. 27" inseam. Five-pocket style. Mid-rise; double waistband detail. Relaxed fit through straight legs. Cropped at ankles. Released frayed hem. Button/zip fly; belt loops. Cotton. Machine wash. Made in Mexico.